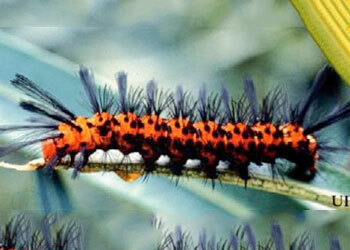 The oleander caterpillar is a bright orange caterpillar with tufts of long black hairs. The adult stage of the oleander caterpillar is sometimes called the “polka-dot wasp moth.” The eggs are found in clusters on the underside surfaces of oleander leaves. They are pale cream to light yellow in color, spherical in shape, and measure less than 1 mm in diameter.